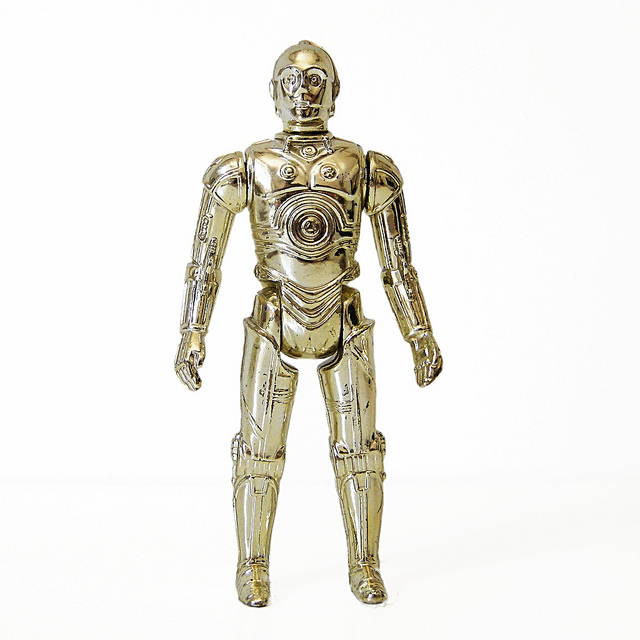 When I was five, a toy robot changed my life.It was 1977. My parents gave me a C-3PO action figure. It’s not my first toy, but it’s the first one I can remember receiving. I hadn’t seen Star Wars yet, but my parents knew their son would like a toy robot. They probably thought it was a small gesture, until they saw the world it opened for me. My Mom was a teacher who combined science, computers and English in her classroom. Her father spent 31 years in the Navy as an officer and engineer. My Dad was an electrical engineer who spent Vietnam in the Marine Corps working radar stations. His father was an electrician and private pilot. Pieces of their lives filtered into my world through the lens of my interest in sci-fi. Mom introduced me to Star Trek (the original series), Buck Rogers and Doctor Who (once she finished watching Agatha Christie on PBS). I didn’t real care about the continuity of these shows, only having access to what the networks streamed to my TV, but what I saw shaped my interest in the future. Of course, PBS also ran Monty Python’s Flying Circus and Benny Hill after their Saturday night block of Doctor Who, so this also shaped my sense of humor (thanks Mom). I saw The Black Hole before I knew that Captain Nemo existed, and watched Star Trek: The Motion Picture before anyone knew the even numbered movies would be better. Dad helped me with science fair projects (even the lame “battery and wire around a nail” variety). I collected a few more action figures… ok, maybe a few dozen … and I (gasp) took them out of the box. Han Solo borrowed weapons from G.I. Joe when his blaster was lost on a playground. Luke Skywalker survived decapitation by Darth Alice, my sister, thanks to The Force (of Krazy Glue). My Death Star playset, complete with everything pictured in the Sears holiday catalog, was lost to an all-too-faithful reenactment of the battle at Yavin IV. Boba Fett was cool, even if he had more lines in the holiday special then the rest of the trilogy. At ten I got my first computer, learned a lot about military aircraft and flirted with being an astronaut. At fourteen, after an unsuccessful attempt at mastering the clarinet, I got my first drumset. At sixteen, I went to a magnet school for science and mathematics, where I heard Rush for the first time (big deal for a drummer, trust me). I also learned to truly study for the first time, having sent a bit too much time my first semester sacrificing academics for video games and weekend AD&D (1st edition, cause monks are awesome). I learned how to edit video, add effects with the Video Toaster, and use the blue screen that made most of my childhood fantasies come to life. I went to college for engineering, got into radio because I liked recording music, played in a few bands and co-founded a student TV station. I got a job at AMI, who thought it was a good idea to send me around the world, which lead me to a job at Intel that likes to do the same. I fell in love woman who worked in a game store and introduced me to sci-fi conventions… which got me back into video … which is why I help run a convention now (and make fun of it at the same time). My dearest friends and loves come from this life, where my interests were recognized and encouraged. Even when I was labeled “the nerd” at my tiny southern high school, my parents never changed course. Dad got me aircraft models and sent postcards from his business travel. Mom quoted Yoda back to me when I got discouraged or wouldn’t focus on what was in front of me. Selling me on Tae Kwon Do lessons at the age of ten was pretty easy, since it was the closest I’d get to being a Jedi in Goldsboro, NC. Also, bullies tend to back off when “the nerd” kicks them in the head after being pushed on a playground. I recently found that old C-3PO in my basement, packed into a Darth Vader shaped action figure case. He’s now living on the shelf above my computer, along with a few R2-D2’s and other toys I never grew out of. In reality, I grew into them … grew through them. Thanks to Dragon Con I’ve met Anthony Daniels, the man in that gold suit. I’ve interviewed him, captured video of him on stage, and been the person to greet him when he wants to talk about how the video will run while he’s on stage. I’ve interviewed Buck Rogers, both versions of Apollo from Battlestar Galactica, 80% of the Mythbusters… pursuing this odd little interest has introduced me to loads of other famous people, along with dozens of people I now call friends. A piece of painted plastic didn’t send me to college, buy me a plane ticket, or teach me how to program a computer. This is story about two parents who watched their son and encouraged him to follow his interests. It’s focusing on why people do things instead of how they do them. It’s the story of a family, picked by blood or by choice, focusing my interests instead of discouraging them to pursue what appeared to be more normal. This isn’t really a story about Star Wars. It’s the story of me. The story isn’t about getting a toy. It’s about what happens next.